The ceramic crystal oscillator (3 pins) has this marking (M) 4914A 2N 1.
a stepper motor SONY MINEBEA CO.,LTD 08BJ-H038-21 (ref. SONY 1-541-532-31) 1513C -Made in Thailand. 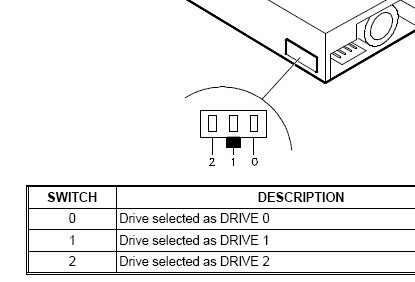 on the card LG-64 (on the side and bottom) you can select the l'ID du reader from 0 to 3 with a switch SW101. The 'ID of the floppy is 1 (default) (Floppy to be use with a P.C./AT . The card includes a matrix of 12 pins header named COR101 to select jumpers; on my unit there are two jumpers between pin 10&11 and pin 4&8. the photointerrupter TLP1020 on the back of the unit to detect that the head is at the end side has the marking 1020-W1L12 and is mounted on a pcb with the marking KPC4594V-0. this sensor has 3 wires : red , yellow and black.